Flooding in Pakistan. Photo by the United Nations Development Programme. Last winter, Washington. D.C.’s Metro system stopped running on its above-ground sections due to snowfall from the “worst winter in local history,” said the Washington Post. Monsoon flooding was particularly brutal in India this year. In the city of Ahmedabad, home to India’s first full-fledged bus rapid transit (BRT) system, Janmarg, road conditions on the BRT routes were washed out and potholed, as Indian papers reported. Further damage to the infrastructure included broken railings and waterlogging. 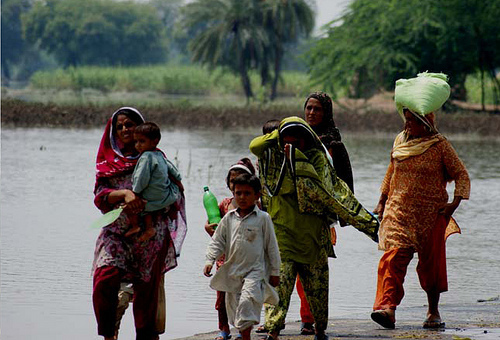 This year Pakistan experienced its worst floods in 80 years, causing bridges, canals and roads to wash away, not to mention the displacement of ten of millions of people. Although adaptation measures are necessary, it is also essential to implement comprehensive policies that will reduce greenhouse gas emissions in order to curb the most severe impacts of climate change.